The Erlangen program of F. Klein (influenced by S. Lie) defines geometry as a study of invariants under a certain group action. This approach proved to be fruitful much beyond the traditional geometry. For example, special relativity is the study of invariants of Minkowski space-time under the Lorentz group action. Another example is complex analysis as study of objects invariant under the conformal maps. In this course we consider in detail the group SL2(ℝ) and the corresponding geometrical and analytical invariants with their interrelations. Consequently the course has a multi-subject nature touching algebra, geometry and analysis. No special knowledge beyond a standard undergraduate curriculum is required. 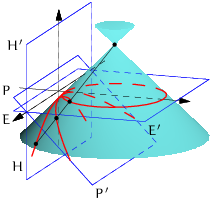 the group SL2(ℝ) and Möbius transformations of the real line. Möbius transformations in the upper half-plane. Cycles (quadrics) as geometric SL2(ℝ)-invariants. Fillmore–Springer–Cnops construction and algebraic invariants of cycles. Linearisation of the Möbius transformations. Linearised Möbius actions in the spaces of functions: the Hardy and Bergman spaces. The Cauchy integral formula as a wavelet transform. The Cauchy–Riemann and Laplace equations from invariant vector fields. The Laurent and Taylor expansions over eigenvectors of rotations. A functional calculus as an intertwining operator. Quantum and classical mechanics from the Heisenberg group and (hyper)complex numbers. Lectures notes for this course are in the process of writing now. The current version can be browsed on-line as Web pages split per chapter, or as the huge single Web page, or downloaded as a PDF file. There is an interactive Computer Algebra System (CAS)  associated to this work, to get started read information about installation and usage. Vladimir V. Kisil. Meeting Descartes and Klein somewhere in a noncommutative space. In A. Fokas, J. Halliwell, T. Kibble, and B. Zegarlinski, editors, Highlights of mathematical physics (London, 2000), pages 165–189. Amer. Math. Soc., Providence, RI, 2002. arXiv:math-ph/0112059. Vladimir V. Kisil. Erlangen program at large–0: Starting with the group SL2(R). Notices Amer. Math. Soc., 54(11):1458–1465, 2007. arXiv:math/0607387, On-line. Zbl # 1137.22006. Vladimir V. Kisil. Schwerdtfeger–Fillmore-Springer-Cnops construction implemented in GiNaC. Adv. Appl. Clifford Algebr., 17(1):59–70, 2007. On-line. Updated full text, source files, and live ISO image: arXiv:cs.MS/0512073. Project page http://moebinv.sourceforge.net/. Zbl # 05134765. Vladimir V. Kisil. Erlangen programme at large: an Overview. In S.V. Rogosin and A.A. Koroleva, editors, Advances in Applied Analysis, chapter 1, pages 1–94. Birkhäuser Verlag, Basel, 2012. arXiv:1106.1686. Vladimir V. Kisil. Geometry of Möbius Transformations: Elliptic, Parabolic and Hyperbolic Actions of SL2(R). Imperial College Press, London, 2012. Includes a live DVD. Zbl # 1254.30001.
visitors to this page since 20/09/2007.